Maisie begins her journey early in the morning on the 7 October, flies for six hours and then stops for a rest on the tundra. At midnight she takes off again, this time her flight will be longer, but at 12 hours it is still a relatively short flight for the migrating swan. After a short rest she soars upward again on another 12-hour flight arriving on a lake south of Arkhangelsk shortly before midday. Maisie has started her migration in a series of short flights rather than crossing the tundra in one long flight like many of the Bewick’s do. Still she covers 460km in less than three days, arriving south of Arkhangelsk by midday on 9 October. The same distance took Sacha Dench, our ‘human swan’ around two weeks. 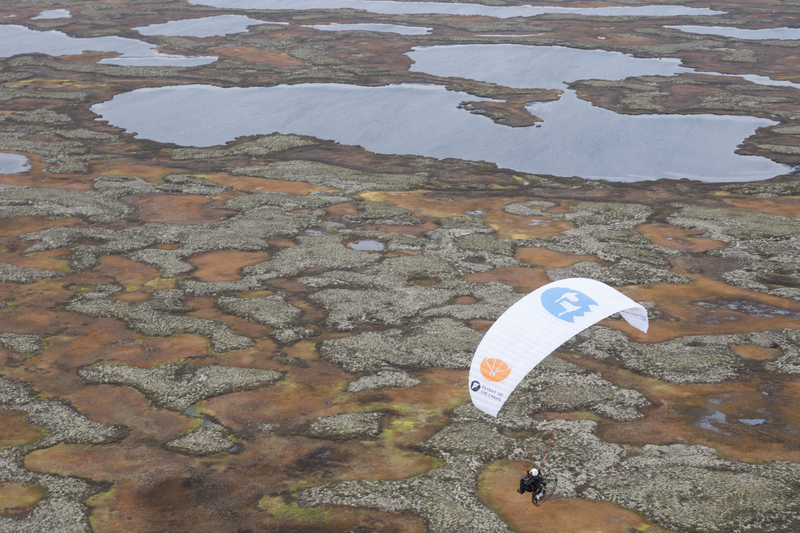 Sacha is flying by paramotor, dressed in Páramo, from tundra to Slimbridge to draw attention to the plight of the Bewick’s Swans, whose numeric decline is a cause for real concern to the Wildfowl and Wetland Trust. 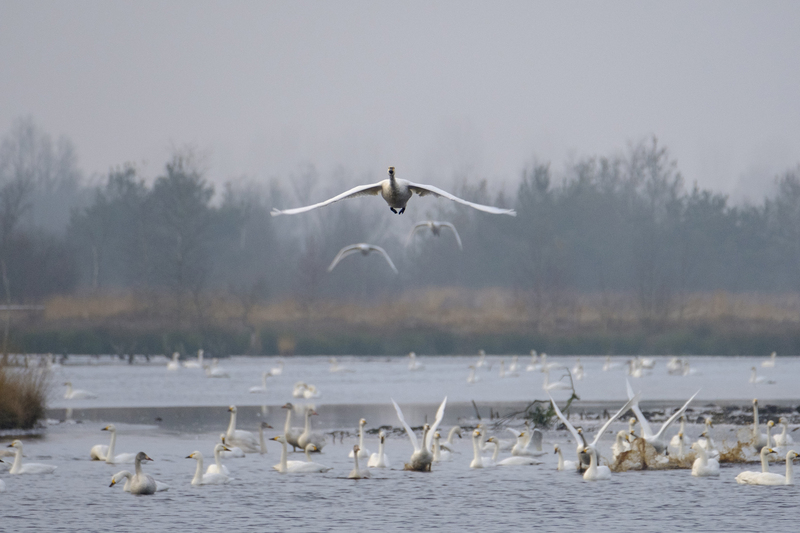 The ‘Flight of the Swans’ expedition will highlight, and hopefully help to reverse, the decline of an iconic – and very beautiful – bird, whose distinctive and unique bill patterns were first documented by Peter Scott, WWT’s founder. With the freezing temperatures of the Arctic chasing her over the wintery landscape, Maisie is now in a hurry and after a quick rest and refuel she takes off again just over 24 hours later. In her haste she even bypasses one of her favourite feeding sites, Lake Ladoga. As the cold wind ruffles her tail feathers she knows she needs to get a move on and sticks to a very direct migration route. So direct that she flies straight over the city of St Petersburg. She doesn’t stop until she reaches the (relatively) balmy shores of Lake Peipsi in Estonia, where for now she is safe from the perils of winter and can have a well-earned rest. The flight has been pretty epic – even by Bewick’s standards – she has covered 800km in a flight that has taken her 36 hours. At the WWT, we’ve been tracking Maisie for several years now and know that one of her favourite places is Lake Peipsi. So now she has landed safely here she makes the most of it and stays for over two weeks. It is easy to see why she loves the lake. It is rich in the pondweed and stoneworts that the swans like to feed on and is the perfect place to recoup after the long flight from the Arctic. Maisie has done some short stop-offs already, but for many swans this spot is their first stopping point after setting off on migration. After feasting and resting Maisie leaves Lake Peipsi on 29 October and spends the next few days crossing Latvia, Lithuania and Poland. She arrives on Lake Holzendorf in Germany on 3 November where she roosts on the lake at night and travels out to nearby fields to feed during the day. She leaves on 12 November and flies 440km in 12 hours to land on Lake Drontermeer, around 50km from Amsterdam. She seems keen to continue with her journey and the next day she flies over Amsterdam and spends a few hours bobbing about on the sea. But something changes her mind and she abandons her onward migration, heading back to the cosy lake, where she stays for another ten days before heading to Lake Veluwemeer in the Netherlands. 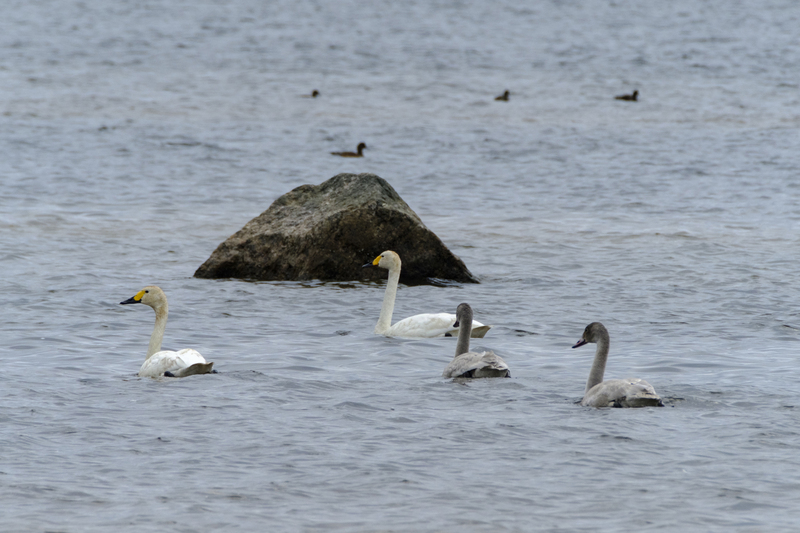 Lake Veluwemeer is another favourite spot for migrating Bewick’s. Rich in the aquatic vegetation they like to feed on, 4,000 birds were seen feeding on stoneworts in the lake during early November. With the weather in the Netherlands mild for the time of year, Maisie can afford a nice long stop-off here. After a week resting and feasting on Lake Veluwemeer, Maisie sets off fully fuelled for the final push. She flies throughout the night, crosses the North Sea and arrives in Norfolk at midnight on 23 November. She stops off just once during the flight. After a well-deserved sleep and some time feeding, she takes to the skies again and arrives at WWT Slimbridge at lunchtime, 3.5 hours later, distinctive with her tracking collar. Maisie has covered around 4,000km by the time she makes her final stop (until she heads north next Spring). 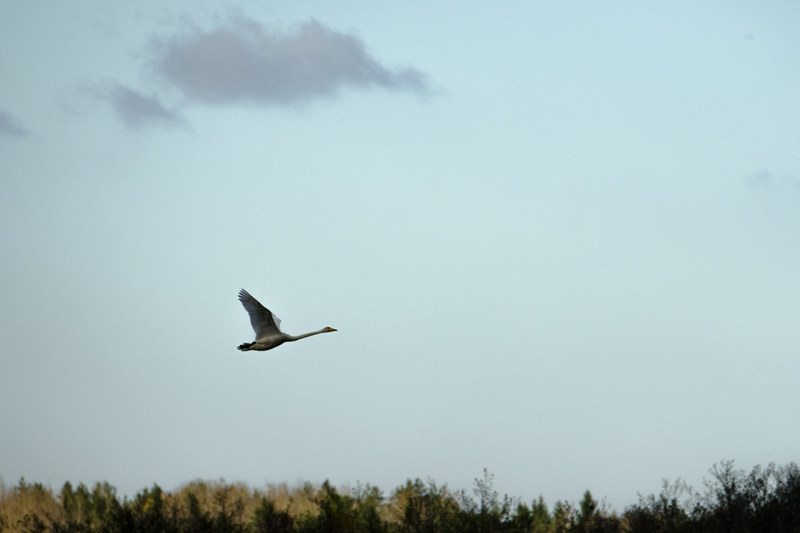 By 14 December when Sacha arrives at Slimbridge, some 149 Bewick’s have made that same migratory journey. 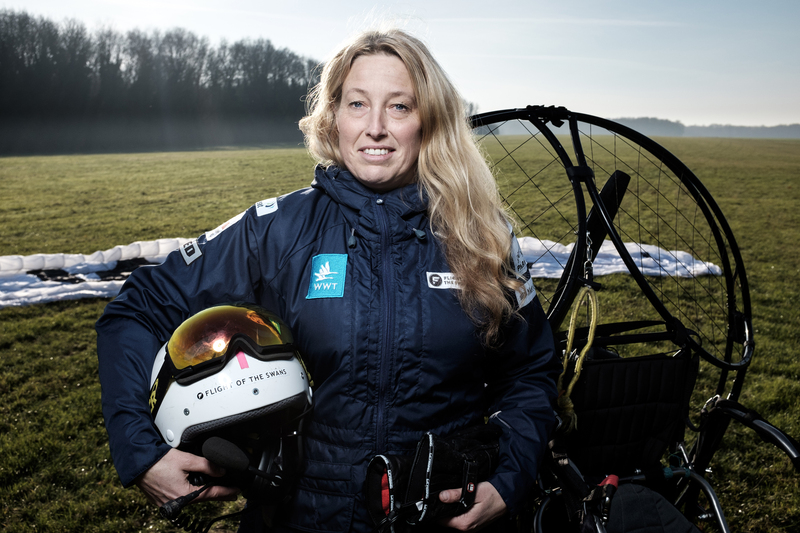 Sacha has flown some 7,000km across 11 countries, but helped by a motor and a team of experts! In doing so she has not only raised awareness of the plight of these birds, and other migratory species, but has initiated crucial conversations about hunting and lead poisoning, farming and power lines with communities along the flight path – and has achieved celebrity status along the way! Her paramotor (and Páramo) have been seen on national television in every country, and she became the first woman to cross the Channel by paramotor. Find out more about the Expedition here.